This chapter focuses upon cultural awareness and how individuals understand their personal views, biases, prejudices, and worldview towards others. Changing demographic trends require training and development specialists, and those in human resource development, talent acquisition, professional learning, and specifically in education, to be prepared to work with diverse populations of the local and the global community. 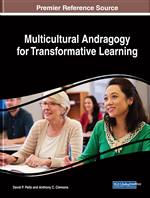 Strategies that improve understanding, communication, and value in working with diverse populations are discussed and a theoretical overview of appropriate theories is provided. Patterns of interaction have changed over the decades as technology has fostered communication, collaboration, and instant participation in multiple ways and in diverse dimensions. A transformation has occurred in communication, real-time interaction, collaborative endeavors, and in the capacity to interact with others in a global setting. This transformation challenges how individuals think and interact with others whose culture, values and beliefs may be far different than their own. Technology has certainly opened virtual doors for engagement and provided opportunities for learning about others in genuine settings. Education, business, organizations, and personal and professional collaborations, afford the chance to learn and to grow in our understanding of others. Professional planners in organizations are challenged to develop training and programs that foster positive interaction and promote the ability and capacity to productively and effectively engage in global ventures. Changing how we have historically operated and interacted is significant in that adapting to new ideologies, beliefs and values of those who differ from ourselves becomes part of a permanent repertoire of our own behavior. This transformation is internal and not dependent upon external forces to preserve. Only in changing individual beliefs and practices, will change occur in how people understand one another. Personal and professional opportunities allow individuals, businesses, and organizations to engage in the global community in real time. Individual global outlooks are dependent upon technology that is virtually connected to all facets of life. Technology has provided access and a limitless range of opportunities to engage and learn about other cultures, life and the world in general. How effectively users do so is the issue, as the work place, social media, and business community all seek to network and develop relationships across very different philosophies, values, principles, and beliefs. In seeking to understand others, it is important to first gain insight into personal belief systems, specifically as they relate to others whose culture, experiences, meanings and concepts of the world and universe may be different than others. Culture has many meanings and many perspectives understood through contexts, settings, self-perceptions, as well as views and opinions of others. Global organizations and businesses work in intercultural teams, strive to improve cultural understanding, diversify strategies and initiatives with a multicultural emphasis all with an end goal to improve and enhance cross-cultural understanding. Terms such as cultural competence, cultural awareness, cultural intelligence, intercultural competency, and diversity are often used synonymously; however, the terms connote different aspects and are differentiated along fine lines of process and application. In the United States, the historical development of a field of study began with the Civil Rights movement as racial prejudice and bias came to the forefront. Businesses, organizations, and educational settings all focused upon the disparity that existed and how to improve conditions for minorities e.g., African Americans and women. Diversity training emerged in the 1960s as race became a predominant social issue. In education, concerns over access, equity, equality, and opportunity became a driving social force as civil rights and inclusion concerns dominated all aspects of life and work. During the 1970s, diversity focused upon barriers related to gender and sexism particularly in the workplace. Diversity is usually associated with differences such as gender, ability in educational settings, and race; it is a quality or attribute based upon the difference from the majority. How differences are valued, acknowledged and accepted is one level of understanding and acceptance. Yet, it is culture that comprises the norms and standards set by the social structure. While we may value diversity or differences, we may not understand those values and norms that are the deeper held beliefs of others and for ourselves., One may not even know of how their personal cultural experiences shape and form attitudes and perceptions towards those who are different. It is not sufficient to simple acknowledge differences but rather be able to value and appreciate those differences with a genuine and authentic understanding. Educators and policy makers face a greater social responsibility as a new majority develops and with that change, the opportunity to grow in cultural intelligence.